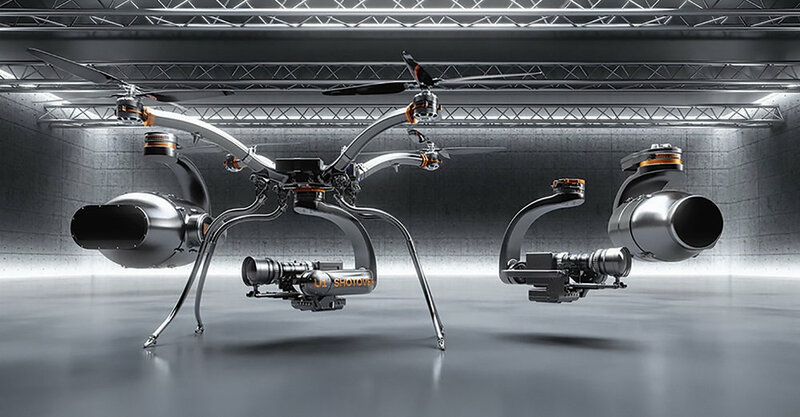 The Shotover U1 is the first multi-rotor aircraft in the world to Accommodate Industry’s most advanced cameras and lens combinations, including large cine zoom lenses. Usually, even heavy lift drones require compromise in terms of lens choices, but the U1 opens up a whole new world of possibilities. The Shotover U1 features a range of safety features including an advanced Battery redundancy system, a secondary flight controller and an on board parachute which can be deployed in the event of an emergency. All of these features help to ensure safe, continuous operation even in the most demanding of environments. With a maximum take-off weight of 40KG, the Shotover U1 is in a class of it's own. Full camera and lens control is available via a proprietary Shotover gimbal control system - the same technology that Shotover utilises in their full size, world class helicopter gimbals. The powerful Shotover G1 gimbal can accommodate a range of heavy camera and lens options, so we can fly high end cinema setups at high speeds, in areas inaccessible by helicopters, with negligible degradation to stability. Due to our partnership with Flying-Glass, we're also able to fly the U1 in congested areas, with reduced separation distances, enabling a whole new level of possibilities. To put it simply, this thing is a beast! Performance wise, the Shotover U1 is in a class of it's own. It's 8 motors and 4 high capacity LiPo batteries deliver an enormous amount of power and allow the U1 to fly at high speeds and jaw dropping climb rates, even while carrying a heavy payload. All the while, the G1 gimbal keeps the camera locked into position with it's 3 high torque motors and robust carbon fibre construction. If you want to fly a large cinema camera and lens setup at high speeds with pixel perfect results, the Shotover U1 is the machine for the job.